Ahh prawns, delicious sea bounty. Some people hate them, most people love them. Paul Hogan cooks them on a BBQ. But with seafood on the menu for many people this Good Friday, spare a thought for the Aussie scientists who are working hard to help prawn farming sustainability. Around 50 per cent of prawns eaten in Australia are imported from overseas. Most farmed prawns are produced using feeds containing wild-harvest fishmeal, contributing to strain on global fish stocks. The problem is pretty obvious – we need to feed prawns something other than fishmeal or our insatiable appetite for prawns could ruin our oceans. Luckily our scientists love fixing problems. The team spent several years learning how to manipulate marine microbial organisms to maximise their productivity in controlled environments, and stimulating them to produce a novel bioactive product to enhance prawn growth. Didn’t quite catch that? Essentially, they’ve invented an ingredient to go in prawn feed that doesn’t contain any fish. In fact, it’s made using low-value agricultural plant waste so it’s actually solving two problems in one! The product, called NovacqTM, isn’t just helping the sustainability of prawn farming, it’s basically a prawn super-food. 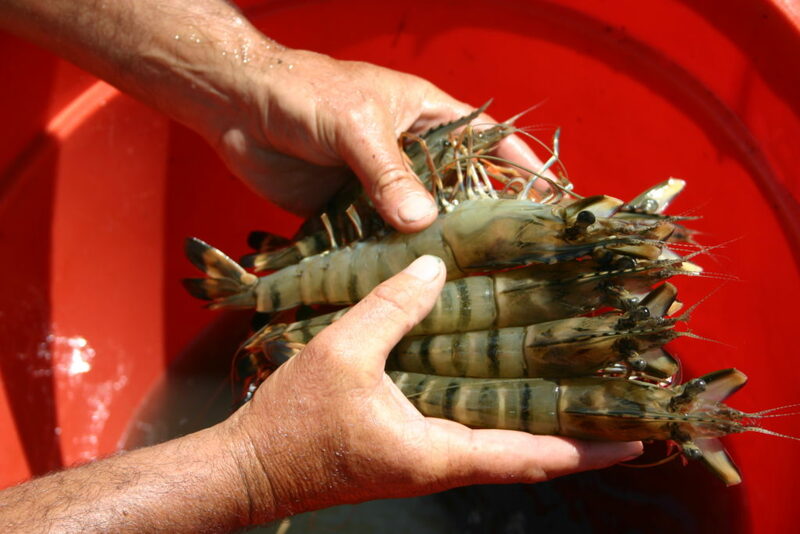 Prawns fed with NovacqTM are healthier and grow on average 20–30 per cent faster. So not only is it better for the environment, it means healthier prawns and a more sustainable industry. So, it’s a win, win… win situation. “What about me! ?” a prawn-hater reading this might say (if they got past the first sentence). “I want my food to be farmed with sustainable feed, too!” Well, never fear you unicorn-like creature (seriously, who hates prawns?!). We’ve just extended our partnership with Ridley Aquafeeds to further our research and knowledge of the Novacq TM technology to see if it can be used as a stock feed additive in a range of species, including land-based animals. So, as you throw another prawn on the barbie (thanks Hoges), raise a glass to our scientists for being generally awesome and making your meal that little bit better. Oh, and if you’re looking for cooking inspiration; we’ve got the perfect prawn recipe for you. They have developed production of beef protein in vats. Can we do same for fish protein? The prawn food. Is it GMO free. I understood from other sources that farm raised seafood does not acquire the omega-3 fats that wild seafood does, since the omega 3 works its way up the food chain from plankton/krill eaten in the wild. Is that a factor here? I’m a chef, prawns have never really been a high source of omega 3. Your looking at around 7g of omega 3 per kg in prawns compared to aroung 55g per kg in other seafood such as mackerel, salmon, & tuna. So, yes if the prawns aren’t eating a seafood based diet, they’ll miss out on omega 3, but they’ve also never been a major source of omega 3 either. Great question Frank! In the wild, plankton make omega 3 and that is how fish and crustaceans accumulate it in their diet. With regard to cultured seafood, this is usually provided by the incorporation of fish oil in the diet. However, recent work has shown that this can be met by land plant based oils from things like flaxseed that also have reasonable levels of omega 3.